Temple of literature , Vietnamese first university - built in 1070 AD( top rated Hanoi attractions) with 82 doctor steles - UNESCO world heritage for education document. Charming hanoi Old Quarter consists 36 commercial streets. You can wander through to see the artisans working on their special craft and souvenirs. 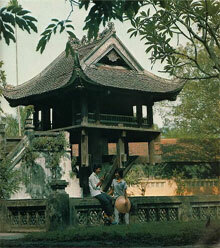 You can see the real life of Vietnamese people here( top rated Hanoi attractions) . If you have more time to spare for Hanoi holiday, there are so many incredibly beautiful landscapes around Hanoi city that are lesser visited by tourists: Tam Coc or Perfume pagoda is filled with series of strange rocky limestone formations rising from a sea of rice paddies. A sampan rowed by locals will let you be more and more surprised at the stunning nature beauty. These areas are the best countrysides for Vietnam tours. Besides the nature beauty, you can also visit vietnamese traditional handicraft villages where you see and try your hands in making ceramics in Bat Trang pottery village or try to paint in old Vietnamese styles in Dong Ho painting village or see the artists making silk in old ways in Van Phuc village or Thay pagoda and Tay Phuong pagoda in the countyside. luxury halong bay cruises !